Before he entered the GAMA/Build A Plane Aviation Design Challenge in 2013, Lee Luckhardt knew he wanted to pursue engineering, but had never thought much about aviation. Growing up in Saline, Michigan, about an hour from Detroit, much of the area’s attention was focused on cars, not airplanes. So when Luckhardt’s teacher registered Luke and his classmates in the national competition sponsored by the General Aviation Manufacturers Association (GAMA), he soon learned about aerodynamic and aviation engineering principles such as the four forces of flight, angle of attack and aspect ratio. “There’s nothing else like it,” Luke said. Instead of focusing on a specific engineering problem, the Challenge focuses on the big picture: What can I do to make this whole airplane work better? Now 21, Luckhardt is a design engineer working part-time at Williams International, a Michigan-based jet-engine manufacturer. Currently pursuing a bachelor’s degree with majors in mechanical engineering and engineering physics at Kettering University in Flint, Michigan, he plans to seek a master’s degree in aerospace engineering afterward and earn his private pilot’s license. Since 2013, the Aviation Design Challenge has helped hundreds of students like Luckhardt improve their Science, Technology, Engineering and Mathematics (STEM) skills using aviation. U.S. high school classes and after-school clubs complete 10 lessons using “Fly to Learn” curriculum and software powered by X-Plane. They then apply that knowledge to modify and fly a virtual airplane on a specific mission, which the software scores. Judges from GAMA’s engineering team use that score, along with other factors—such as a checklist of the changes the team made and videos the students submit throughout the competition—to determine the winner. 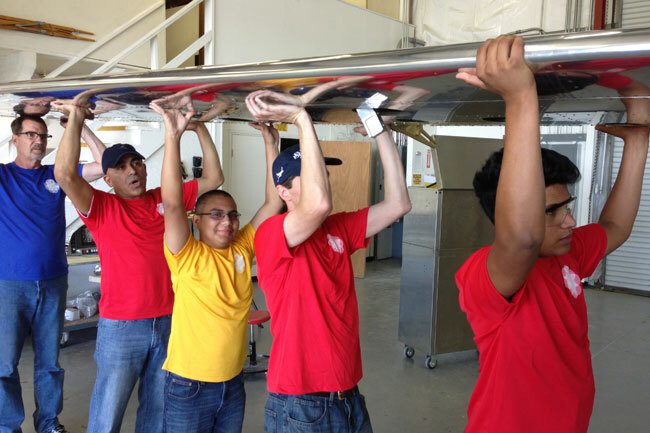 In addition to Luckhardt’s team, high schools from Canby, Minnesota; Las Vegas, Nevada; Cuba City, Wisconsin; and Weyauwega-Fremont, Wisconsin have won the annual contest, earning the chance to help build a Glasair Sportsman airplane in Arlington, Washington. Besides improving students’ knowledge, GAMA and Build A Plane started the competition to expose more teenagers to aviation-related careers, including professions as pilots, engineers, manufacturers and maintenance personnel. 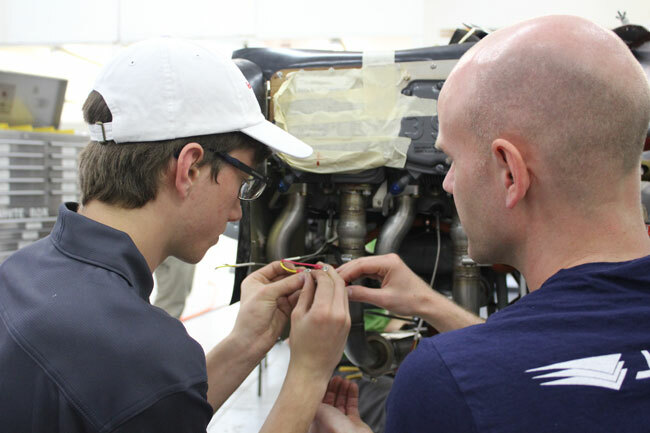 “As our industry looks for more talented young people to fill the variety of aviation jobs that will open up in the coming years, this program has already demonstrated that it’s an excellent entry point for high school students and a valuable educational resource for their teachers, mentors and administrators,” GAMA President and CEO Pete Bunce said. The 2017 winner will receive an all-expenses-paid trip for four students, one teacher and one chaperone to experience general aviation manufacturing firsthand next summer, sponsored by GAMA member companies. 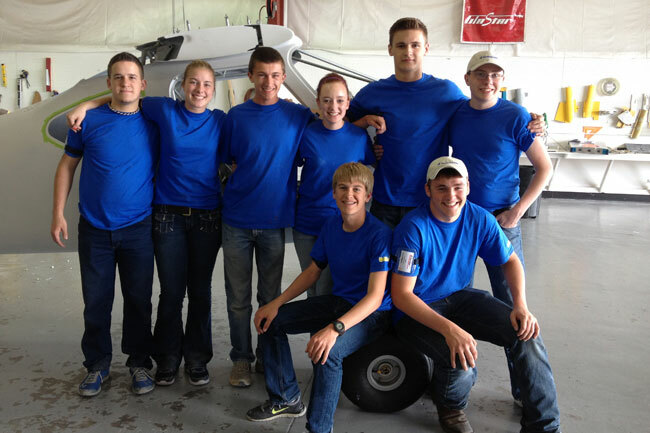 For each of the last four years, the winning team has spent two weeks at Glasair Aviation in June. From 7 a.m. to 5:30 p.m. each day, they work alongside staff from Glasair, GAMA and Jeppesen as the Sportsman morphs from a fuselage kit to an airplane that taxis and passes its FAA certificate of airworthiness before they leave. “The kids aren’t just handing tools” to professionals, former Jeppesen CEO Mark Van Tine told Washington’s Everett Herald newspaper in July. “They’re drilling holes, riveting, doing fabrication. 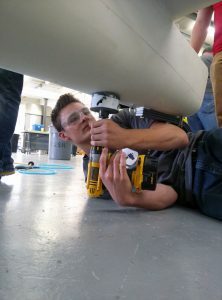 They’re doing real work.” Van Tine helped launch the competition in 2013, when the winning teams from Saline and Canby assisted him in building his own Glasair Sportsman. He’s been back to support the build twice and remains a champion of the initiative. While having high school students assemble an airplane may sound like a risky proposition, other owners have also been impressed. The students “work hard and fast,” Dennis Willows, a retired University of Washington professor who was the 2016 builder, told the Everett Herald. “They’re sharp.” Willows made the build a family event by bringing along his teenage daughter Grace and grandsons Angus and Ian to work with the winning team. 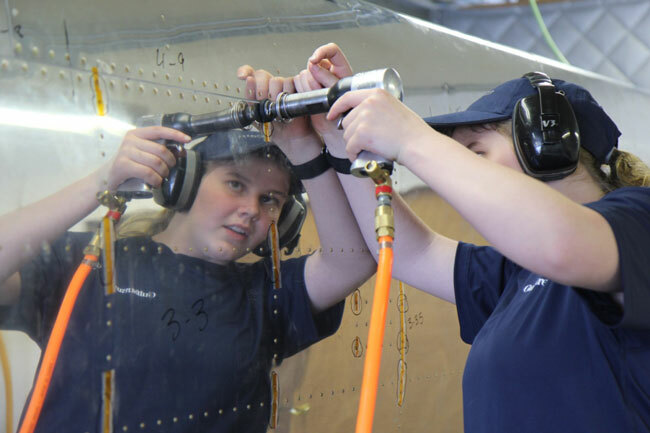 Over the two weeks, the students learn “all the parts, front to back, of the airplane, inside and out—just the physical structure and how things work together to make a plane fly,” Weyauwega-Fremont High School teacher Mike Hansen said. Junior Natasha Stemwedel, one of the 2016 winners, wants to become an aeromedical nurse with knowledge of how aircraft work so she can help return the rotorcraft to flight if it needs repairs. In addition to learning about aviation, the students also developed their public-speaking skills as advocates for aviation. The Weyauwega-Fremont team briefed their local representative, U.S. Congressman Reid Ribble (R-WI), about their winning entry before they left for Glasair this summer. They then met with U.S. Congressman Rick Larsen (D-WA), who represents Glasair’s district and serves as the Ranking Member on the House Aviation Subcommittee, during the build. And they talked with Wisconsin Lieutenant Governor Rebecca Kleefisch when they attended AirVenture in July. Thanks to the Aviation Design Challenge, Luckhardt does, too. Learn more about the GAMA Aviation Design Challenge and Build A Plane. This is such a great article, and it brings back so many wonderful memories. I was part of the group that took on the first GAMA/Build A Plane Challenge in 2013, along with Lee, and it changed my life. While my story is different from Lee’s, and I am not going into the aviation field, I realized my true passion on that trip. I gained so much confidence working with the Glasair team, and I learned life skills that have carried me through my college career. Now a 21 year old and a junior at Minnesota State University Moorhead, I am one year away from graduating with a major in Public Relations and Advertising and a minor in Graphic Communication. While in Washinton on the build, I found my passion for working with people; people who need a voice. I am excited to give great people, like the ones I worked with in Washington, a voice that can be heard across the country. While my path doesn’t involve engineering or manufacturing, I have still been greatly affected by my experience with the GAMA/Build A Plane competition. I never would have found the confidence to follow my passion, and I am forever grateful for this lifechanging experience.